GET A SOLAR WATER HEATER TODAY! Installing a solar water heater or heat pump is an effective way of heating water and saving up to 25% or more on your energy bill. Request a quote and learn more below. Note: The Accredited Service Provider Programme is specifically for Solar Water Heaters but many of the service providers also supply and install Heat Pumps. Ask your service provider if a heat pump is appropriate for you. We will select 3 Accredited Service Providers on your behalf that are best suited according to your location. Based on your selcted Accredited Service Provider choices, we will process your enquiry accordingly. In light of the ongoing drought crisis and residents’ continued water saving efforts, owners of solar water heaters systems may be concerned about water loss. Please see this this advisory from the City of Cape Town which provides owners with practical suggestions on reducing water loss through overheating that may occur as a result of lower hot water consumption. Recent media articles have suggested that there may be issues regarding the safety of solar water heaters in scenarios of low water pressure or water outages as may be expected during the upcoming months during the water crisis. However, this is incorrect – there is no risk for most correctly-installed systems. Please see this advisory, written after consulting with experts in the industry, from the City of Cape Town on the matter. 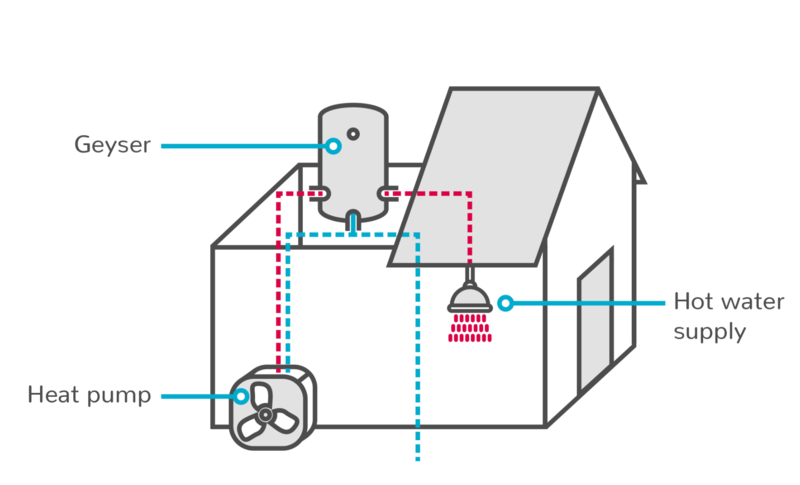 What is a Solar Water Heater or Heat Pump? Electricity to heat water in your home is usually the biggest portion of your household energy use and the biggest contributor to your electricity bill. Installing a Solar Water Heater or Heat Pump are effective ways to efficiently heat water and save you 25% or more on your energy bill. 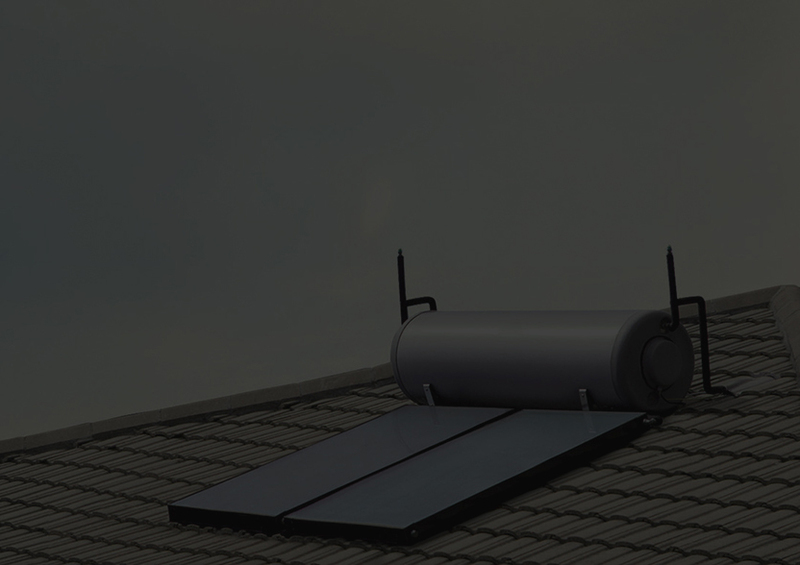 Solar Water Heaters use the heat from the sun to warm up water in panels installed on your roof. During winter or cold spells, electricity back-up is typically used to ensure that the water is heated. 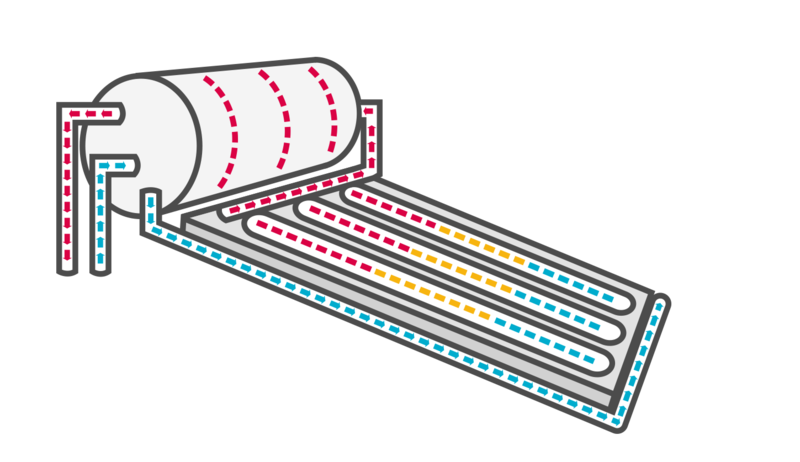 Heat Pumps work like air conditioners in reverse: they take heat from outside air and transfer it to water inside the heater through a heat exchange system. The unit is typically mounted on an outside wall. See our FAQs for more information about different kinds of systems and installation options. Why get a solar water heater or heat pump? Save 25% or more on your electricity bill by upgrading to a solar water heater or heat pump – the best investment you can make right now. See more on the costs and saving benefits at our FAQ section. See the FAQs for information on when a heat pump may be a better option for your home. Heat Pumps are typically slightly more expensive than solar water heaters, but may have a better return on investment, depending on your hot water usage patterns. We’ve made it easy for you to invest in a solar water heater. Choose a City Accredited Service Provider and ask for a quote, and you’re on your way. You can be sure that they will deliver expert advice, service and installation of SABS-approved quality systems. Our Accredited Service Providers will give you advice on what geyser to get and how to deal with a replacement of an old or burst geyser. The average price for a 200 ℓ solar water heater is about R23 000, however there are financing options available. If you can’t easily finance the purchase through your bond, most City Accredited Service Providers offer financing options so you can purchase a solar water heater with no upfront payment and regular monthly instalments. See below for more information about financing options. As electricity tariffs increase in the years to come, installing a solar water heater will give you long term savings. Electricity prices are high and rising, and the reliability of power supply is always a concern. Installing a solar water heater from our Accredited Service Providers is one less thing to worry about in life: the product quality has been verified, and warranties, certificates of compliance and service contracts are all provided, thanks to the City’s accreditation programme. And the City helps ensure installers meet and sustain their strict quality standards. Should your electric geyser burst or fail, it would be the perfect opportunity to upgrade to a more efficient water heating system. Preparing in advance for who to call and what geyser would suit your needs will give you peace of mind for when it happens, and a plan for upgrading to solar or heat pump that would save you money and provide hot water for years to come. Check your insurance policy or contact your insurer to find out what options you have – some insurers offer the option to replace a damaged geyser with a solar water heater or heat pump, allowing the client to pay in the difference between the insurance pay out and the cost of the more energy-efficient water heating system. If you do not have this option, your insurance may offer a cash pay-out for replacing the geyser, which you can use to finance your new system. 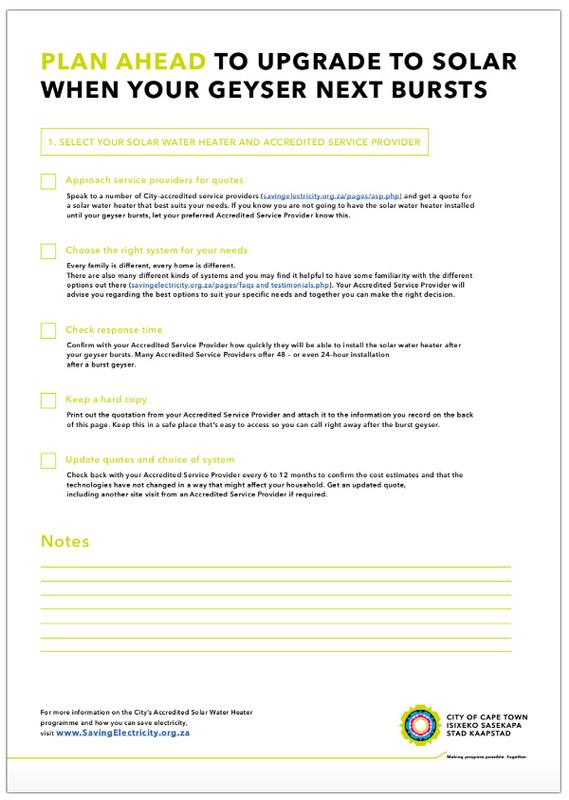 Download our handy checklist to help you plan ahead to upgrade to solar when your geyser next bursts or fails. If you apply for bond finance for a new home, or plan on making additions or renovations, then adding the cost of a solar water heater (or heat pump) generally makes good investment sense. You could save about R5 000 or more per year if you have a 200-litre solar water heater installed for a household of four people*. Getting a quality solar water heater has never been simpler, easier or more affordable. 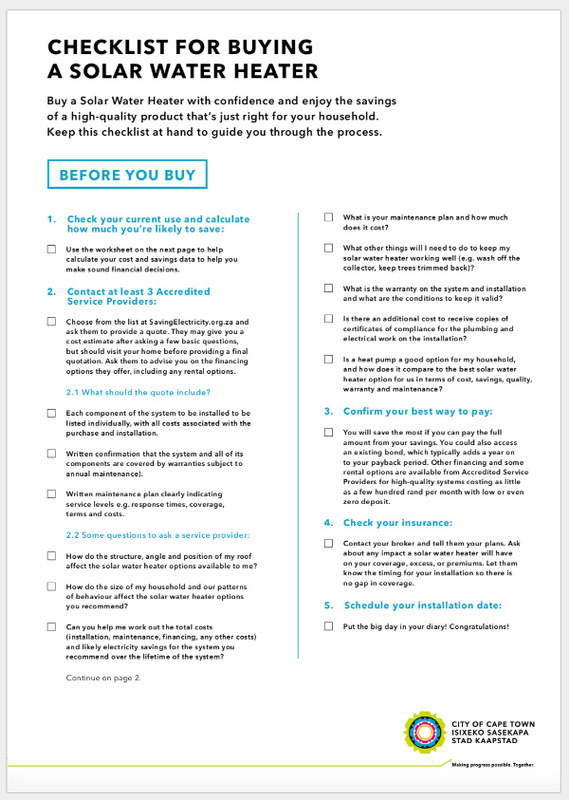 See below and download our handy checklist for buying a solar water heater. Use our application at the top of this page to request quotes from three or more of our accredited service providers. You can view the full list here if you would like contact them directly. You can choose with confidence and peace of mind knowing they all meet rigorous standards for their competence, quality of products used, quality of installation, customer service, maintenance and other aspects of their business. They also agree to uphold a code of conduct regarding how and what they sell, how they service their customer, how they respond to any complaints. Many of these service providers also offer heat pumps, so ask them if this technology is appropriate for your home. Your Accredited Service Provider will advise you regarding the best options to suit your specific needs and together you can make the right decision. See our FAQs for more information about the different systems available. Each of the solar water heater systems they offer through the programme are SABS certified – that means each individual component of the system as well as the entire system – so all are top quality. Heat pumps are also a good alternative but as yet, are not SABS approved – see our FAQ for more info. Nevertheless, make sure your service provider can provide an SABS Test report and warranty for the heat pump they intend to install. The best option is to use your home loan (as it provides the best interest rate if you are borrowing money). Many Accredited Service Providers offer financing options so you can purchase a solar water heater with no upfront payment and regular monthly instalments. Some Accredited Service Providers offer rental plans, and you can also see if your bank offers any financing options. Choose the most cost effective option for you. 4. Enjoy your piece of the sun! Once installed, you will start enjoying the benefits of lower electricity bills, knowing you have also lowered your carbon footprint. And with significant amounts of locally manufactured or assembled components in your solar water heater, you have also helped our local economy create jobs and stay competitive. * Every household is different. Check the FAQs for more detailed information on likely savings, payback periods and more. All figures given are only indicative and can change over time.